Since my site redesign, this graphic doesn't quite fit on the page anymore; I'm exploring different options, in the meantime you can see it on a standalone page. Thanks to Chris Kirk, interactives editor at Slate.com for reposting this graphic and dramatically increasing my number of Twitter and Facebook followers! I'll try not to let you down, new friends! The idea for this graphic came from this homeschoolpromqueen tumblr post about how to visually categorize the data in this Edward Tufte blog post about how to present the data in this American Cancer Society publication about the number of cases of different types of cancer diagnosed in the United States every year. 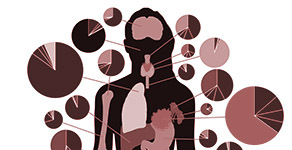 The 5- to 20-year mortality rates come from a 2002 study. 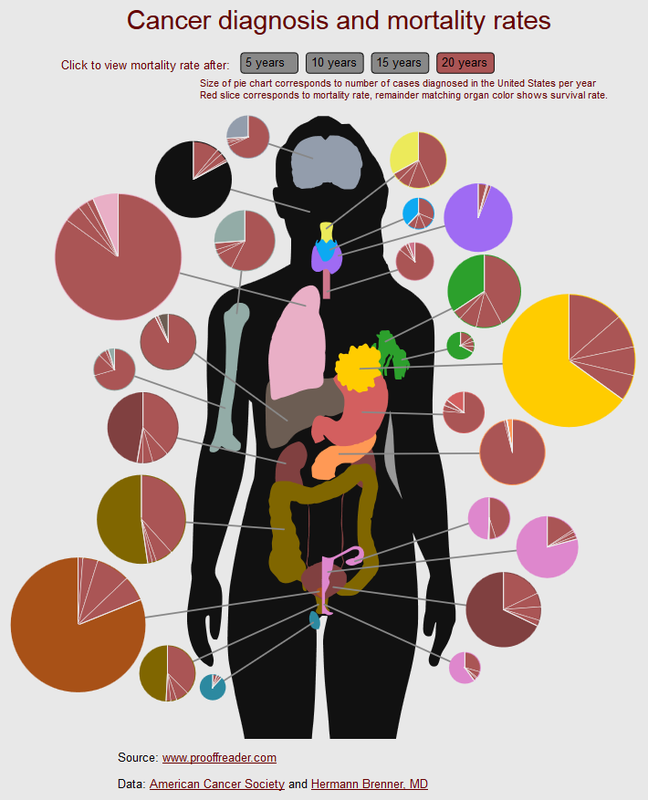 It occurred to me that the visually most potent way to present such a large amount of data was to anchor it to something everyone knows intimately: our own anatomy. Note that since 2002, the consensus of some of the the 5- and 10-year mortality rates have changed, but to my knowledge that study is the only one to present mortality rates for virtually all types of cancers up to 20 years. Rather than cherry-pick and include data from different data sets which could be misleading when compared, this one data set was used. I strongly encourage those interested to do some googling for more up-to-date numbers! I learned a few things about cancer while doing this, things which may seem obvious in retrospect but nothing's obvious if you don't have the opportunity to think about it. For example, the more survivable cancers appear to be in organs you can remove, like the breast or prostate: that makes sense. I wonder why the most diagnoses are in some of these organs, too: knowing nothing about medicine, I wonder if any of this is because they're easier to diagnose. And the pie chart for pancreatic cancer is revealing; there's a huge five-year mortality rate, but it hardly increases at all after that; once you've gotten past a critical time period (which I'm guessing is much shorter than five years), your outlook vastly improves. EDIT Tuesday, Feb 11, 7:46 EST: There were a few errors in the graphic that I have corrected; I humbly apologize, you should never proofread (or prooffread) your own work. The only error that was truly grievous was that I had lung cancer at about 2/3 the correct diameter. I believe (fingers crossed) everything is accurate now.